LNG protesters disrupt LNG career forum for children in Kamloops, B.C. 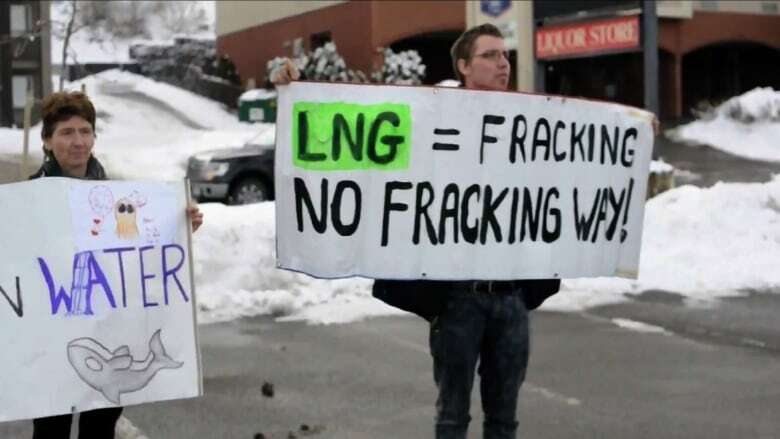 What started as a forum teaching children about potential careers in LNG, was turned into a protest by several local anti-fracking demonstrators on Tuesday. Protesters at an LNG career fair in Kamloops, B.C. "We went to intervene and let the children know that they have choices," said Kanahus Manuel, one of protesters. "Whether it is clean water or indigenous land rights, they have choices on where their position is going to be as the future." The protesters were eventually forced from the conference by RCMP officers. Carl de Bruijn, the Superintendent of Schools for Kamloops Thompson, says he was concerned about the students' safety. He agrees they should learn about all sides of the issues around LNG, but he doesn't think the protest was the best way to teach them. "We want them to realize that people have the right to protest but they have to follow some basic decency while they're doing it," said de Bruijn. He believes the forum was valuable for the students because it was a rare opportunity for them to learn about potential careers. "It's about offering students a variety of interactive career exploration activities," said de Bruijn. "They learn about all kinds of different jobs that exist." About 750 students have attended the forum so far.